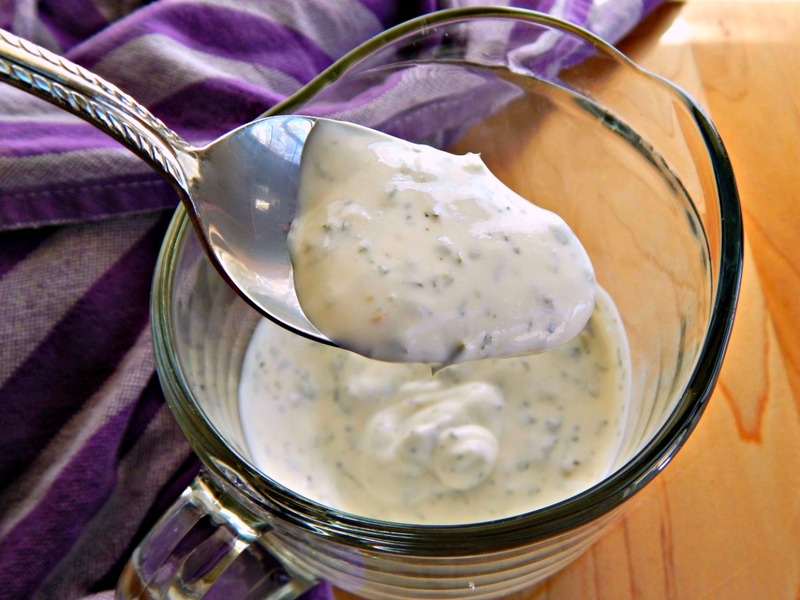 I have a confession – I’ve never warmed up to Ranch dressing. Everyone I know loves it…but not me. Sometimes I think I’m a lone hold out. Until now. Well, I think I love this one. Even in the dead of winter with only dried herbs. It’s herby, it’s zippy and has a bit of tangy richness that you can’t ever get from a bottle. And I know what’s in it without having to have a chemistry degree, which makes me happy. Me and chemistry? You don’t want to go there. I was traumatized. But back to the dressing: Make it a bit ahead so those herbs have time to release their flavors and make it as thick or as thin as you’d like by adjusting the amount of buttermilk. Honestly, you could just use regular old milk if you don’t have buttermilk. The Greek yogurt & the vinegar have enough tang to carry the flavor home. Use the seasonings and herbs to your taste. I’d suggest mixing with the minimum amounts (unless you know you like REALLY herby and zesty) and let it sit for about 20 minutes, then taste and adjust. You can always jot down YOUR ultimate amounts. Mix all ingredients. Let sit for 20 minutes. Stir, taste and adjust. This entry was posted in Click here for Fabulous Food Posts and tagged Appetizer, Buttermilk, Condiments, ranch dressing, Salad Dressings, Spreads and Dips, Vinegar, Yogurt. Bookmark the permalink. Yogurt anything and I’m a fan! Now you can have the most American of condiments, lol!! Do they even HAVE Ranch in the UK? If you look in the right stores, I think so. Some of the salad dressings sold here are American brands. Newman’s Own comes to mind. But I live at the back of beyond, so we don’t a wide range of stores, and the stores don’t carry many dressings. My impression is that the idea of salad dressing is a recent one. When we first visited, side salads were usually lettuce. Period. I like a sharpish home-made dressing of my own, but my partner got tired of it a few years back and prefers bottled ones. I’m guessing she’d welcome a home-made ranch–especially a relatively low calorie one. And I wouldn’t mind a change myself now and then. That’s interesting to know, Ellen. My Grandmother used to make a little dressing with bacon grease that I think hearkened back to the Old World. I’m like that with bread. I find one that I think I’ll love forever, and at a certain point it wears out and I want something else. I would probably enjoy this too! I think the bottled Ranch that tastes like plastic has turned many a people off of ranch. Not my fave either but this take on it sounds really good. It’s the TEXTURE of bottled Ranch, too. It’s got a sliminess I don’t care for at all. Ok, so I don’t like ANYTHING about it, lol!! I will try this, I am also not a fan in general. I think you have to be of a certain age – like a child – when it first came out. I also can’t help but think of those baby carrots (which I hate on principle, lol) and ranch dressing. *Shudders. * And then my son went through a stage where he wanted Ranch on everything. Oh I tried and tried to discourage THAT but then he moved on to hot sauce. I’d have to hide it to have any to cook with, lol!! Ha ha! Ranch was never a favorite here but my kid has never left the hot sauce stage! I use a very similar recipe & just love it! Same as you, I wasn’t a big fan until I tried that recipe!